CPQCC is committed to reducing disparities in the way that infants and families are cared for and treated in the NICU. Our disparities research is led by The Profit Lab under the direction of Dr. Jochen Profit, CPQCC Chief Scientific Officer and Associate Professor of Pediatrics at Stanford University. CPQCC is currently developing a Disparity Dashboard to help NICUs evaluate racial/ethnic disparities in quality of care. Providers can use the disparity dashboard to assess NICU performance on a variety of critical quality measures with options to compare outcomes within each measure by race/ethnicity. The dashboard, which will be available to all CPQCC NICUs as part of their membership, will provide feedback on disparity scores to NICUs and will serve as the starting point for understanding and developing solutions that address disparities in neonatal care. The concept for the Disparity Dashboard emerged from a CPQCC study published in August 2017 on racial and ethnic disparities in care across 134 California hospitals. The study used the Baby-MONITOR, a composite measure. of NICU quality, designed by CPQCC, to evaluate disparities across five racial/ethnic groups. 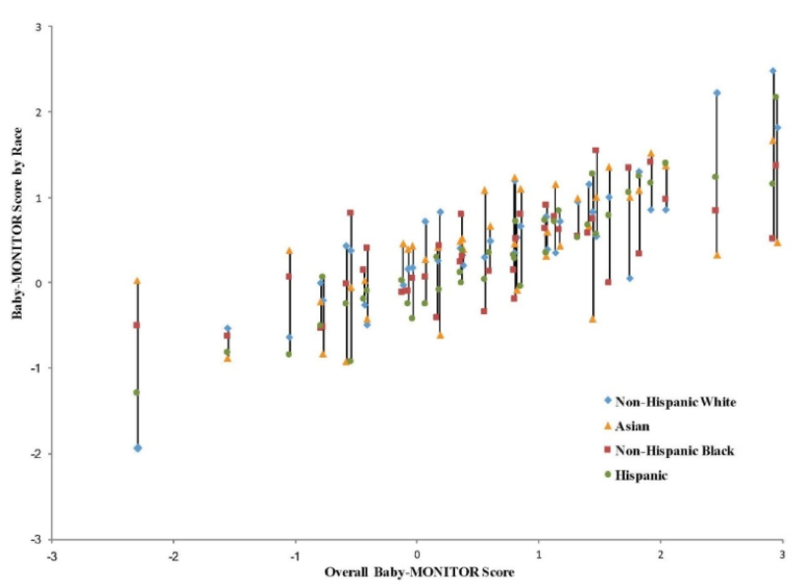 The graph below shows an example of Baby-MONITOR scores for black and Hispanic infants at 40 of the 134 hospitals, which indicate that these infants received worse care overall when compared to white infants. While certain hospitals actually provided better care to black and Hispanic infants, hospitals which scored high on overall quality of care tended to treat more white infants and those with poorer quality of care primarily black and Hispanic infants. CPQCC is developing comprehensive models that take into account social and neighborhood level factors, in addition to clinical and hospital level factors, when assessing the quality of NICU care. These models will help us better understand factors that contribute to disparities in neonatal care and outcomes. 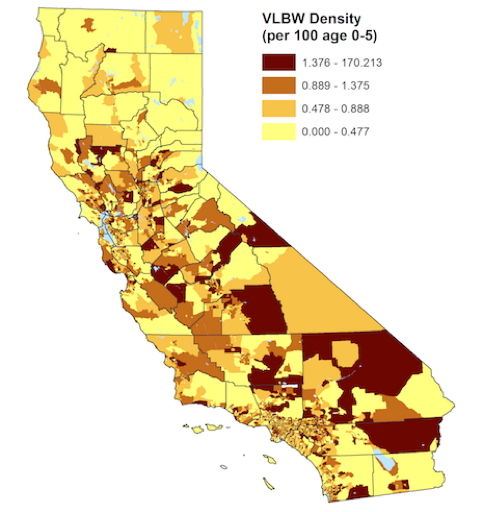 Initial assessments have found that neighborhoods with higher numbers of very low birth weight (VLBW) infants are more likely to have lower socioeconomic status. CPQCC, in partnership with NICU families, is developing quality measures to assess the extent to which NICUs are providing care that is “family-centered.” The development of the measures is influenced in part by qualitative research conducted by CPQCC researchers which analyzed 324 narrative accounts of disparate care witnessed by family advocates and clinicians in the NICU. These stories revealed that disparate care is often targeted at families and not the infants themselves, suggesting the need for NICU care that is equitable, inclusive of families from all backgrounds and responsive to the individual needs and circumstances of families. Family-centered care is grounded in the idea of partnerships between health care providers and families. It recognizes that families are essential to the quality and safety of a patient’s care. While guidelines exist for how to provide family-centered care, implementation varies widely. Existing assessment tools and inventories to assess family-centered care use surveys, making them impractical for monitoring and improvement at a population level. Concrete measures of family-centered care, developed in partnership with families, will allow NICUs to provide care that is responsive to individual needs of families regardless of their socio-economic status or racial/ethnic background. 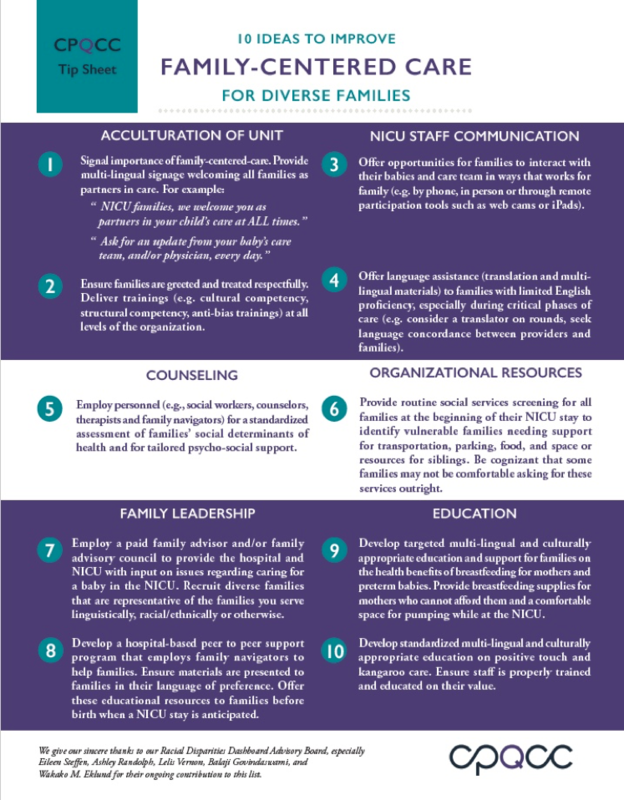 In April 2018, CPQCC released a tip sheet with ten suggestions on how NICUs can improve family-centered care and ensure that it addresses the needs of diverse families. Read more about the Family-Centered Care Tip Sheet.